Who doesn’t love receiving gifts on the good old mail? A couple of days ago, I got startled by an exaggerated door bell noise “Canada Post, I have a package for Georgia Brown.” So I grab Georgia on one arm and run down the stairs. It was a package of treasures: two beautiful pictures books and a green peppa snuggly rabbit (the ones with wool inside especially designed to gather smells, memories, and miles). Precious! Georgia laid beside me wit her peppa near as I flipped through the books. So this post is dedicated to “the other” Brown family in Cawston who sent us these gifts, Corey, Colleen, Simon, and Mia. Through the Coastal Mountains they travelled. In a beautiful Valley they settled. Healthy and happy chickens they raise. While Simon and Mia thrive in energy, health, and charisma. From the first time I met Simon I’ve been charmed by his adventurous spirit and smiles. And Mia, she is one of a kind. Or, one of my kind. Tough, but so incredibly sweet. She likes the color Pink and doesn’t put up with mean roosters. We don’t see each other as often as I wish but I notice them grow, move on to the next grade, learn riding all kinds of wheels, and hear stories that happen in their own world- acres of backyard where everything is possible. These guys chose the quiet life. Not so quiet when you have rooster and kids running around in the morning. But their home is a place of nurture. I look up to their gentle and respectful ways of parenting. And look out for the blue Toyota whenever I’m in town, just to wave hello. On to our book… This one, I must say, is one of my favorites of all times. 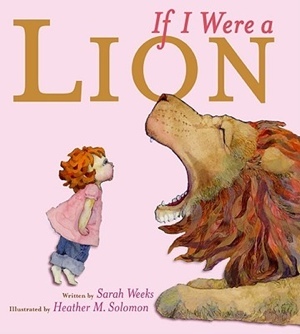 If I Were a Lion written by Sarah Weeks and illustrated by Heather M. Solomon. The book begins with this young red-haired girl sitting on a corner (time-out chair) and her mother saying “You try my patience, child! I do not like it when you’re wild.” The following spreads take us on a journey of this girl’s imagination. Taking on examples from the wildest animals she goes to portray what wild really is and what wild will do. And why is it that she isn’t wild. The illustrations are fantastic! As if straight from a child’s mind they picture animals going wild inside the girl’s home. 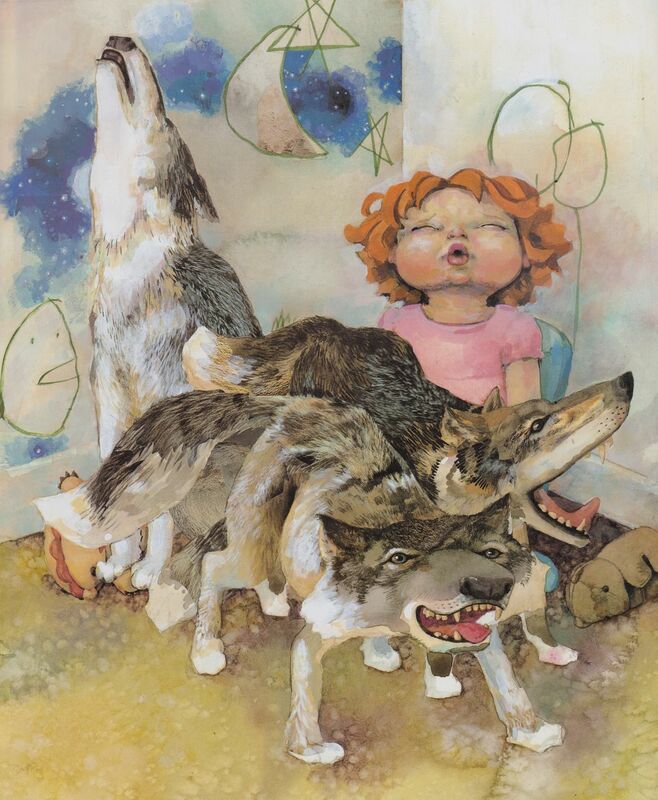 Wild coyotes howl to the moon and rummage through the trash, an orca whale splashes in the kitchen sink, seals and walruses scatter around the tiles… Like every child this girl is creative and knows right from wrong. She brings incredible creatures to her home, which turns out in chaos, just to show that if she was wild…. Things would be a lot worse! I love the playful text and the textured illustrations, which incorporate the girl into images of her fantasy. We make mistakes, we drive our parents crazy, we make a mess, we hide, we can be mean…. One thing is that we have to learn from it, know how to fix it up when we can, and apologize when we can’t. Until one day, we are on the other end, as parents of our own wild child.